On Wednesday evening, the Potomac Nationals (48-54 Overall, 23-28 Road, 15-17 Second Half) lost series Game Two of their best-of-three set on the Grand Strand against the Myrtle Beach Pelicans (60-43 Overall, 29-23 Home, 19-15 Second Half) by the score of 8-5 at Pelicans Ballpark on TicketReturn.com Field. Both clubs bashed 12 base hits in the three-run win for the Pelicans. Potomac is now a (3-11) team vs. Myrtle Beach in 2015 and the P-Nats are just (1-5) against the “birds” at Pelicans Ballpark this season. Myrtle Beach starting slinger, RHP Daury Torrez (8-6) beat the Nationals for the second time in ’15 and earned his eighth win this year in the process. Torrez pitched 6.0 innings and allowed two earned runs on four hits without walking a batter. Torrez hit one batter and fanned four batters. P-Nats LHP Matthew Spann (0-6) remains winless in the Carolina League in ’15 after giving up five runs (three earned runs) on eight base hits in just 4.2 innings. Spann walked three men, plunked a batter, unleashed a pair of wild offerings, and struck out four. The Pelicans spotted Torrez an early 3-0 lead with a trio of runs in the 1st inning as Myrtle Beach 2B Chesny Young dropped a single into shallow center field, RF Mark Zagunis blooped a one-base knock into right-center field with one out, and 1B Cael Brockmeyer walked to load the bases. Pelicans 3B Jason Vosler then rapped an RBI fielder’s choice to Potomac 2B Khayyan Norfork who threw the ball away at second base allowing Young and Zagunis to score. Vosler was credited with one RBI. A wild pitch from Spann brought home Brockmeyer. Myrtle Beach plated two more runs in the 4th on an RBI triple blasted to the wall in right-center field by SS Carlos Penalver and a sacrifice fly to the same alleyway by Pelicans DH Daniel Lockhart giving the home team a 5-0 advantage. The Nationals put a two-run spot on the scoreboard in the 5th inning via a run-scoring triple punched to the right field corner by P-Nats C Zach Wright and a 6-3 RBI groundout raked by Norfork to make it a 5-2 game. Potomac RHP Phillips Valdez pitched 1.1 perfect innings with one strikeout to his line. The stringy, hard-throwing righty stranded the bases loaded in the 5th by inducing Lockhart into a 3-1 groundout in back of Spann before hanging a zero in the 6th. Then, a three-run home run yanked into the grandstands in left field by Pelicans CF Trey Martin off Potomac RHP Brian Dupra gave the birds an 8-2 lead. The deep fly was Martin’s first four-bagger of the season. Dupra went 2.0 relief innings and allowed those three earned runs on four hits and one walk while garnering one strikeout. A furious comeback reminiscent of a three-run 9th in the series opener was put together by the Nationals in the 8th inning off Myrtle Beach RHP James Pugliese, who surrendered three earned runs on seven hits. With two outs, 3B Drew Ward cranked an RBI double to dead center field, SS Stephen Perez ripped an RBI single into center field, and Norfork went back up the middle to drive in one run. A one-out single from 1B John Wooten, Ward’s two-bagger, and the single of Perez came in to score in the stanza. The Nationals put together five straight hits in the inning (four base knocks off Pugliese including an infield single from Wright and a first-pitch-swing single from RF Narciso Mesa off Pelicans RHP James Ferris) to produce the three runs. Ferris got Nationals CF Rafael Bautista to roll out 5-3 to leave the bases loaded and end the big threat. After Dupra worked through a scoreless bottom of the 8th, Pelicans closer, RHP Jasvir Rakkar (12 SV) came in as the fireman and submitted a perfect 9th. Rakkar racked up his 12th save in his 15th save chance as LF Alec Keller roller over on a 4-3 groundout, Wooten chopped a corner-to-corner sweepout, and Nationals DH Grant DeBruin popped out to Young at second base to end the game. In the series finale tomorrow night, the Nationals will throw RHP Brian Rauh (2-0, 0.51) against a to-be-announced hurler for the Myrtle Beach Pelicans at Pelicans Ballpark. The contest is set to start at 7:05pm. 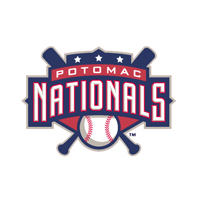 This will be Rauh’s first appearance with Potomac since being assigned to the Nationals from the Class-A Hagerstown Suns on July 26th after Rauh began the season with The Red, White, and Blue.